Piper Willoughby, author of the highly-anticipated new release, Musings On Weirdness In Love And Meditation: A Divine Love Journey, joins me in studio. The book has been welcomed with open arms by those in the spiritual community and those on the twin flame journey. It shares the story of the main character's (Annie) spiritual awakening (which was triggered by her twin flame Alex), her connection to energies and entities in other dimensions, of her sexual awakening, and of separating from ... See More her husband with love and compassion. Both Annie and Alex are here as mirrors for all of us on our own paths, sharing their spiritual journey to self-love. 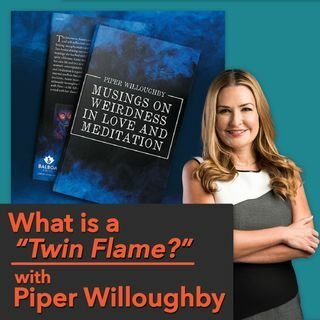 In this episode, I connect with Piper Willoughby about her book explaining what a "Twin Flame" is and what it means to you. Do we all have a twin flame? Is a twin flame and soul mate the same thing? Find out more about twin flames, how to know if you have one, and what it means to realize you are in a twin flame relationship.